Another fabulous weekend! Over 500 singers from 20 choirs on Saturday and 500 singers from another 21 choirs on Sunday, coming from as far afield as London, Bedfordshire, Southampton, Sussex and Cheshire, and it was great to welcome some very local choirs too. 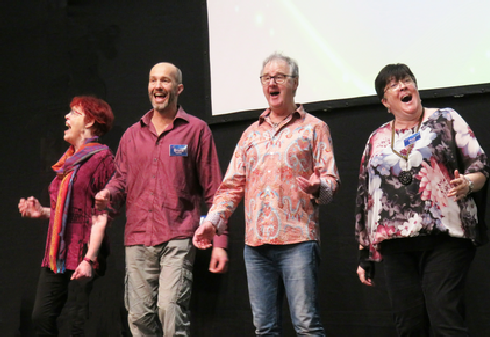 We had a fabulous day of glorious singing, harmonizing, laughing and socialising, with 500 happy, excited singers congregating for the mass workshops. We learned ‘I’m on my way’ a traditional Spiritual arr. by Ali Orbaum, ‘Winter song’, a Victorian poem arr. by Roger Jackson, ‘Do the Locomotion’ arr. by Bruce Knight and ‘Halala Afrika’ by Bongani Magatyana, all in wonderful four part a cappella harmony, led by our inspiring and talented workshop leaders. The Community Choirs Festival is a wonderful day of mass harmony singing workshops followed by a concert, by the choirs, for the choirs. The festival is totally non-competitive, and seeks to celebrate the joy of singing in harmony together. The festival is open to any choir or singing group who welcome all voices without auditions and sing a cappella. 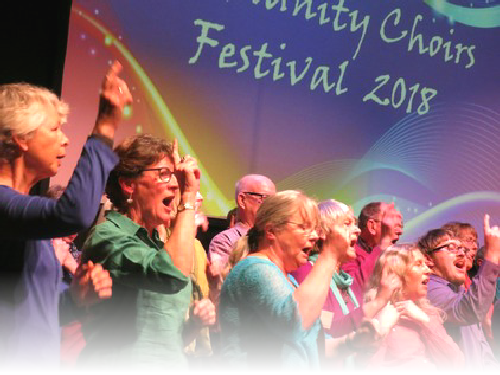 Whether you are a small group just starting out or a well established community choir, the festival offers a wonderful opportunity to sing with up to 500 like minded singers, in a relaxed, fun, friendly environment.